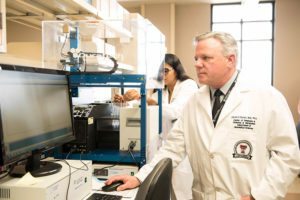 TTUHSC El Paso biomedical sciences professor David P. Cistola, M.D., Ph.D., had his moment in August 2014 when he and his research team discovered a blood biomarker that identifies individuals who could be at risk for Type 2 diabetes and prediabetes. That discovery could revolutionize how the early changes that lead to diabetes are detected—giving patients the opportunity to make lifestyle modifications or initiate therapies that prevent the disease from developing in the first place. The biomarker, water T2, is extremely sensitive to changes in metabolic health. As water is the most abundant molecule in the blood, water T2 can be measured using a small drop of blood from a finger stick. 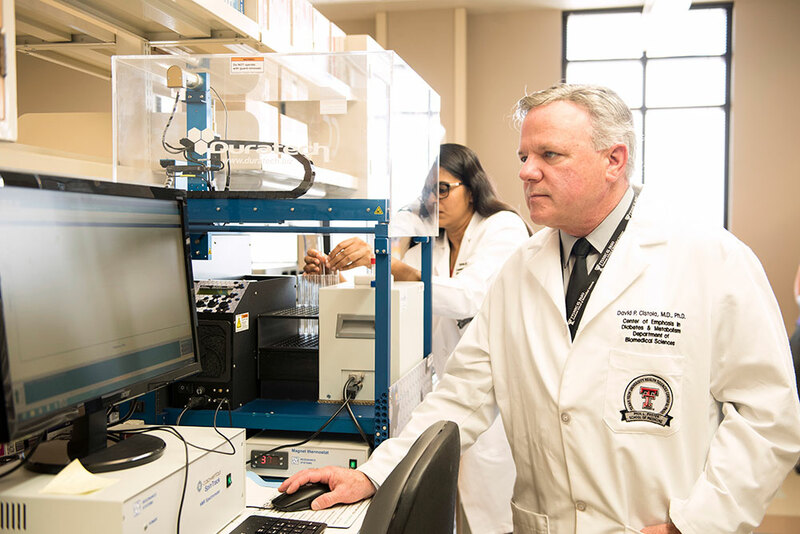 David P. Cistola, M.D., Ph.D., director of TTUHSC El Paso’s Center of Emphasis in Diabetes and Metabolism, has discovered a biomarker that could help detect a condition that precedes Type 2 diabetes early enough to prevent the disease from taking hold. The biomarker, water T2, can be measured in just a few minutes using a small blood sample from a finger stick. The water T2 test has parallels with cancer screening, where the goal is to detect individuals in stage 1, rather than stages 2 or 3 after the disease has spread. 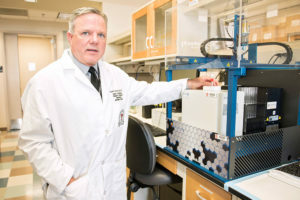 “Stage 1” in the progression toward Type 2 diabetes is characterized by insulin resistance and chronic inflammation, as well as barely sufficient insulin secretion, said Dr. Cistola, director of TTUHSC El Paso’s Center of Emphasis in Diabetes and Metabolism. If not corrected, these processes will progress and gradually destroy insulin-producing cells, causing other abnormalities throughout the body that can later become diabetic complications. Dr. Cistola knew immediately he was on to something. “I remember literally taking the results and running down the stairway and talking with (colleagues) about how to develop this technology. With scientific discovery, there’s serendipity involved. You start collecting data, and you often don’t know what you’re going to find,” he said. David P. Cistola, M.D., Ph.D., director of TTUHSC El Paso’s Center of Emphasis in Diabetes and Metabolism, explains the function of a tabletop NMR relaxometer, a simpler and much smaller version of a MRI instrument, used to detect water T2 in a blood sample. Blood in a narrow tube is placed into the device and within minutes, it produces a reading on metabolic health. A robotic-arm system moves the process along more quickly by inserting and replacing the vials automatically. The National Institutes of Health (NIH) recently awarded Dr. Cistola a two-year, $229,500 grant to validate and expand upon his initial findings, which were published in the Journal of Translational Medicine. The grant will support the validation of water T2 using biobanked samples from subjects who participated in the PREMIER Study, a randomized clinical trial. The blood samples are being provided by the National Heart, Lung, and Blood Institute, the division of the NIH that awarded the grant. The instrument for measuring water T2 uses technology similar to magnetic resonance imaging (MRI), but is miniaturized into in a tabletop device about the size of a toaster. Fifty microliters (the equivalent of one small drop) of blood is drawn into a vial and placed directly into the device without the need for chemical reagents. Within three minutes, a measure of an individual’s metabolic health is obtained. If many samples are to be analyzed, a robot can be used to automatically change samples and speed up the process. Poor metabolic health affects at least one-third of U.S. adults and is a risk factor for both Type 2 diabetes and cardiovascular disease. Because current screening tests do not detect these early abnormalities, the best opportunity for potential disease prevention is missed. Dr. Cistola’s initial T2 biomarker study involved 72 participants. The validation study, expected to start this fall, will expand the sample size to 810 people, with 4,860 individual samples to be analyzed in TTUHSC El Paso’s lab. The samples were originally collected, frozen and biobanked in the early 2000’s as part of the PREMIER study. The parent study recruited people with mild to moderately elevated blood pressure and then randomly assigned them to three different treatment groups to see which lowered blood pressure. “A number of the study participants had poor metabolic health, not just elevated blood pressure,” Dr. Cistola said. By testing blood samples from the three intervention groups, Dr. Cistola will be able to show how the T2 measurement is affected by different lifestyle changes. If the water T2 improves with a reduction in insulin resistance and inflammation, then it’s a very powerful tool for monitoring changes in metabolic health, Dr. Cistola said. The ultimate goal is to implement this technology in primary care clinics and community health centers. Doing that will require technology transfer and company partnerships. Dr. Cistola has been receiving guidance from David Snow, Ph.D., in the Office of Research Commercialization for the Texas Tech University System. Dr. Cistola is hopeful that one day, thanks to this research, patients can be screened for metabolic health using this simple and rapid test during a routine doctor’s visit. 1Guariguata L, Whiting DR, Hambleton I, Beagley J, Linnenkamp U, Shaw JE: Global estimates of diabetes prevalence for 2013 and projections for 2035. Diabetes Res Clin Pract 2014, 103:137-149.